“There are few people who have made their mark on life quite like monk Hua Chi. He has knelt to pray so many times that his footprints remain deeply, perfectly ingrained on his temple’s wooden floor. Hua, who is about 70, has been performing a strict daily ritual at the site in the monastery town of Tongren, in Qinghai province, China, for nearly 20 years. Every day before sunrise, he arrives at the temple steps, places his feet in his footprints and bends down to pray a few thousand times before walking around the temple. 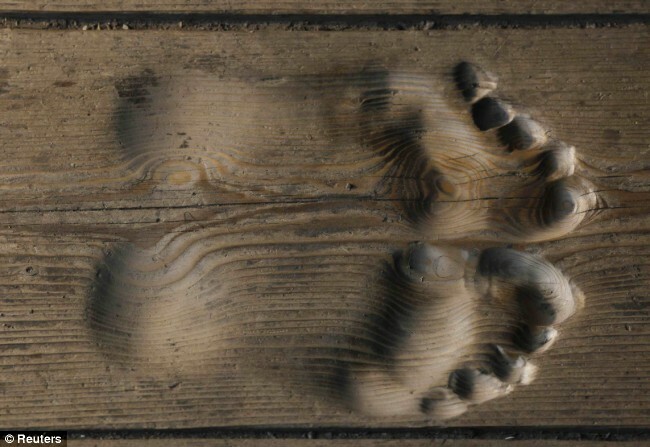 The footprints are 1.2 inches deep where the balls of his feet have pressed into the wood.” – Is It A Miracle? is this impressive or just the “imprints” of a life spent kneeling…..
Aren’t they really just alternative perspectives on the same pursuit? I think we all subjugate ourselves to the things we are passionate about and believe in, at least those of us that actually do care and believe in something. Is this any different than the callouses on the hands of a rower? If an oar handle held up as long as a floor, I think the wood would eventually show the same grooves of its owner’s fingers. Or the trails in Beacon Hill beaten down by the same runners striding over them over and over. Each person is a belief system of their own. Each person achieves peace differently. It’s how we reach that state of grace, of nirvana. Perhaps those footprints show a man who achieves a state of total euphoria in his own mind. Perhaps he truly doesn’t like travel, perhaps he doesn’t have the money or the means. Perhaps he views life without materials, his purpose in life is to pray to things that exist, but that go unseen?